Bizarre's first title with new publisher Activision may have been in familiar territory - the under-appreciated Blur - but its new game has the studio taking a direction its never gone before. The license-based game. Not just any old license though - the James Bond franchise. So no pressure, then. After seeing a little bit of third-person action adventuring - and playing some high-speed driving - the feeling of intrigue has been replaced with solid interest. 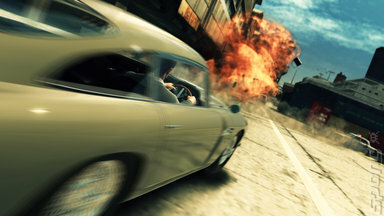 The studio makes no bones about taking inspiration from past titles such as The Club for the combat scenes and Blur for the driving segments, but the feel and play of these mechanics are very much different. Rather than a 'pick up and play' attitude, Bizarre has tweaked them to feel more like an action blockbuster. It can be seen when the digital Daniel Craig starts his journey towards a dam to chase down a villain called Rak - the looming towers are always looking down at you, and it feels like an uphill struggle beating up enemies, earning focus aims and using them to take out two or three enemies in one go. 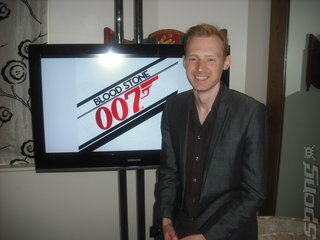 Much like Daniel Craig's Bond, there are barely any gadgets in Blood Stone. The only piece of technical wizardry he has at his disposal is an augmented reality smartphone, that allows you to survey the area around you and find weak points in structures and bosses. I sat down with level designer Peter Collier to discuss the challenges in designing stages that make the player really feel like they're part of the action, and what inspirations the studio took in to making Blood Stone the next true instalment of the 007 franchise. SPOnG: Bizarre has gone from working with Sega to becoming a first party within Microsoft and now to Activision. Has this had an effect on how you go about developing your games? Pete Collier: I don't know if I can make any active comparisons between them, but I can say that working with Activision gives us access to an awful lot of tools that we might not have been able to use before. So for Bond, it's been great for us to have that agreement with Eon Productions and Danjaq to give us full access to them and to everything they can offer us. Really, being a part of Activision has been a great benefit to us because it just gives us more capability to make our games. SPOnG: How challenging – or fun, I guess – is it to design levels in Blood Stone that play out like an explosive, interactive action movie, like a James Bond film? Pete Collier: It's a very interesting experience, especially with the driving levels – that's very different in that it's not simply creating a track like with PGR or Blur, but it's more about... it's not a technical exercise, it's not mastery of a track, it's about a cinematic experience for the player. 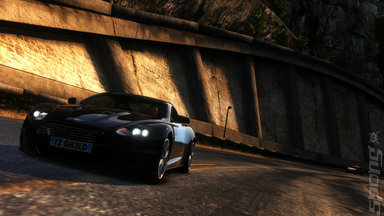 It's edge-of-the-seat, almost feeling out of control feeling, full throttle through hugely dynamic sequences. For example, the Dam level that you saw before – Bond's crash landed, and at an incredibly lowly point. He's just landed in a swamp in the middle of the jungle and he's got to get to Rak who's way up high, hiding in the top of the dam. From my perspective, it was all about creating that feeling of ascent but in a kind of emotive sense for the player, and as Bond is moving through the environments you've always got to feel like you're getting closer to the villain. It's an emotive thing that you design for in the level. And then of course, there's the combat. One of our main focuses for that was in the takedown system, and the way in which it rewards you with a focus aim mechanic. We had to look at the way in which we laid our cover differently as well, because what that takedown system provides with the focus aim is a strategic element. Do I run across and takedown that guy or do I hang back and use cover to take them down from around the corner? So that was interesting as well, taking on that. It's very different from the way in which we laid out our cover and other elements in The Club, for example. SPOnG: Blood Stone has a mix of action elements and driving elements. Did you look back at past James Bond games in terms of how to best approach Blood Stone? Pete Collier: We did, and they helped inform us. 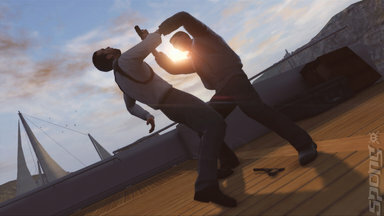 If you're going to make a Bond game, you've got to look at previous Bond games that have been released. It's just good practice to go back and see what those games did right and what fans enjoyed. Everything or Nothing, for example, had a huge variety and breadth of different gameplay elements, and we felt that fans would want to see a package similar to that as well. It's not so much a focus on just combat and shooting, it's also... I think people related to those titles more because they're more authentic to the Bond experience. He doesn't just shoot in the films, he is more about action, exciting vehicle sequences and the physicality in how he deals with foes. For us, the biggest influence was watching the two Daniel Craig films. 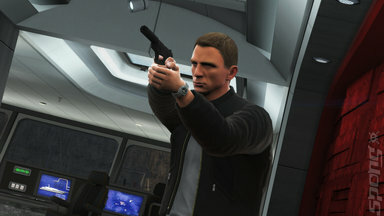 The whole team went on what can only be described as a 'school trip' to the cinema to watch them, come back to the studio and try to define the Daniel Craig Bond experience – what it is specifically that Daniel Craig brings to the character, and how can that apply and inform us about what the central design pillars are for the game. So first and foremost, you've got to 'be' Daniel Craig's Bond. Everything we do design-wise has to be based around that. You look at what that entails – it's physicality, brutality, aggression and direct all rolled into one. He's not about gadgets, he's just about assessing his environment and taking swift action. We try to embody that in everything that we've done. If we didn't deliver on that, people would see it straight away. We've really gone for the authenticity of the experience, and if we pull it off well though, I think people will really appreciate that. @connery - How about some actual criticism pal? Because frankly this sort of tedious, pointless 'commentary' is a waste of everybody's energy. I'd suggest you either contribute something positive or you just go and do some salmon fishing somewhere quiet. I think the fact you're still here shows that you have no interest in offering anything constructive and every interest in being a negative pillock. I don't normally address people who just want to sling unwarranted and unnecessary insults around - and your command of the English language and grammar doesn't really show a respect for the written word, if I'm being honest - but I'm curious about a few things. 1. What exactly about this article has got you in such a tizzy? 2. How exactly is this any different from other interviews elsewhere? 3. Were you expecting something tabloid, perhaps? 4. Did we do something to offend you in a past life? 2. on one level it's not different, which is a problem in itself. on another level the quality of the writng and the questions make no one in their right mind want to read it. 3. something tabloid? you mean you think this is some masterpiece? tabloid would have been better. also, Svend, your command of 'the English language and grammar' leaves a lot to be desired. as if people bother speaking properly in comments anyway. i'm only still here coz it's humourous to see that this thread of a few comments in the longest on this site and i'm wondering how long it'll get. Thanks for answering the questions, although they were neither helpful or constructive. And again, insults won't really get you any respect. I don't think you can put yourself on any pedestal of literary greatness when you admitted that you're simply a troll. This is far from the longest comments thread, by the way. So I'll leave it at this, thank you once again for your input, and realise that we can't please everyone with every editorial. Some features are fun and witty, others are more informative. You wanted the former, by your own admission, when we provided the latter. To call it outright 'boring' and imply that it is worthless as a result is more than a little bit harsh. But that's your prerogative. But hey, at the very least we bothered to respond to your comments directly, eh? See you around.